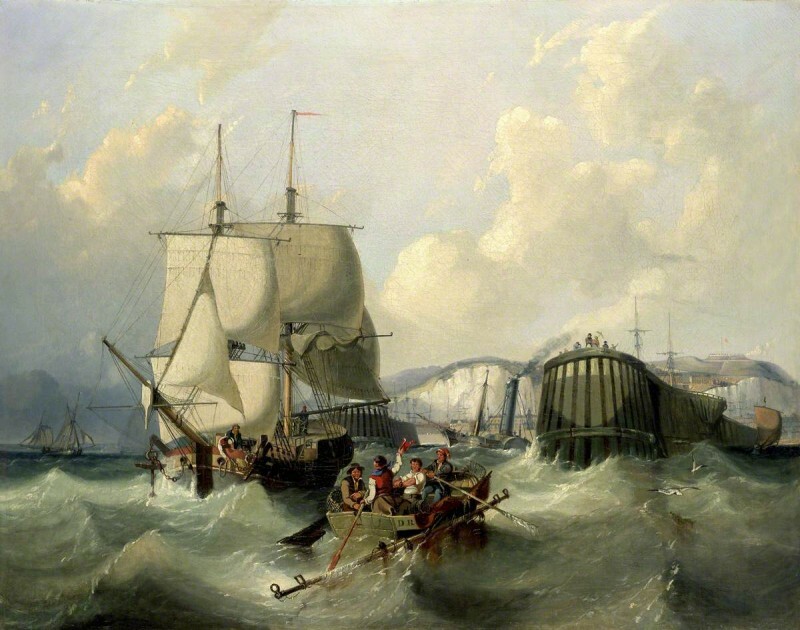 A painting in the National Maritime Museum’s collection has long been called 'A Brig Leaving Dover', because its background bears a superficial similarity with Dover’s white cliffs and a small boat in the foreground bears the initials ‘D. R.’ on its stern. Pieter van der Merwe, Art Detective Group Leader of the Maritime Subjects group, doubted that Dover was truly the location shown. He was also unconvinced that the artist was George Chambers I (1803–1840) – the painting did not meet the artist’s usual high quality. Art Detective user Cliff Thornton pointed out the small space between the ship’s boom and the billowing sail, where the artist painted a white cylindrical structure that stood on the end of the west pier at Dover. This was a precursor to the subsequent lighthouse that appeared in later views from the 1830s. Thornton also provided an alternative link to an image by John Carpenter that showed the same circular structure at the end of west pier. Another user, Martin Hopkinson, produced a newspaper cutting from the Dover Historian about a painting by Clarkson Stanfield of the western pier, Dover. It was engraved by J. W. Appleton in 1836 as part of Clarkson Stanfield’s Coastal Scenery. The discussions that followed, produced more significant evidence, particularly the Stanfield Dover Pier print from 1836 that Jacinto Regalado traced, plus proof that George Chambers I painted the scene. This discussion convinced Pieter that the painting depicted Dover and that Chambers painted it, although with some doubts as it did not measure up to his later-career quality. With that, he closed the discussion and wrote an amended description for the collection's website, which Art UK used to update the painting. Is this brig really leaving Dover? Is George Chambers I the artist?